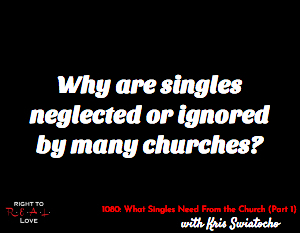 In this episode, Jay is joined by singles ministry advocate and speaker Kris Swiatocho to address the question: Why are singles neglected or ignored by many churches? Why are singles neglected or ignored by many churches? Why many churches struggle to reach singles. How ministry directed towards singles has changed over the years. Why singles are neglected or ignored by many churches. The importance of appreciating and valuing our singleness. Kris shares how she changed her approach to singles ministry. Activate God’s promise to His people by drawing near to Him. Commit to memorize God’s law and promise to His people in James 4:7-8. Pray and ask God to help you humbly submit to Him and put His laws into practice and live it.